Hull is 15th on table with 26 points (15 points at home) while Sunderland is 16th on table with 25 points (12 points on the road). Hull played 8 times a draw while Sunderland played even 13 times. Hull is a little better form with 7 points from last 5 matches in premier league while Sunderland won 5 points. Hull lost 1-0 against Stoke in last round while Sunderland lost 2-0 against Manchester United. 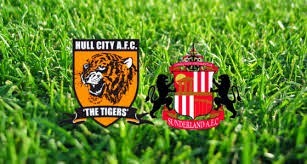 This season Hull won 1-3 in Sunderland but now I expect draw because teams don't want to lose this important match in fight to stay in the league. I try with Hull on halftime because they play at home and they play a little offenisve but draw at the end of the match.